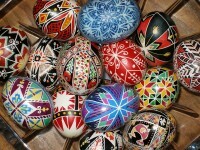 Create beautiful Easter eggs in the traditional Ukrainian style. A workshop for adults and children (children must be in at least grade 2 and accompanied by an adult). Wednesday April 17, 6-8 PM. For adults. 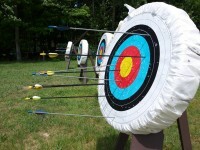 This 6 week program will introduce you to the world of archery through hands-on step-by-step instruction by an experienced certified instructor. Thursdays, 6-8 PM. May 2- June 6. Every Wednesday at the Cumberland Legion! A weekly gathering for mothers of newborn to toddler aged children. Tuesdays 3:30- 5 PM. April 2- June 18. We acknowledge the generous financial support of the Province of British Columbia, School District 71, The Village of Cumberland, Cumberland Dental Centre, United Way Central & Northern Vancouver Island, Rotary Club of Cumberland Centennial, Cloutier Matthews Chartered Accountants and First Credit Union. CCSS acknowledges the ongoing support of the Cumberland Community School, numerous local businesses and organizations, and the many volunteers who contribute their time to help organize and run our programs, services and community events.